Want more detail? Get the Complete 7 Day and Night Detailed Forecast! Weather Topic: What are Nimbostratus Clouds? 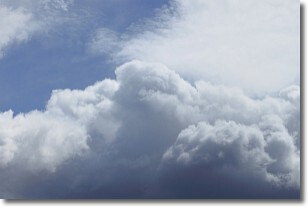 A nimbostratus cloud is similar to a stratus cloud in its formless, smooth appearance. However, a nimbostratus cloud is darker than a stratus cloud, because it is thicker. 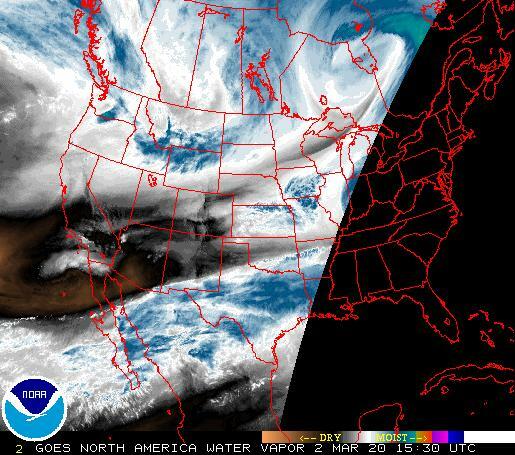 Unlike a stratus cloud, a nimbostratus cloud typically brings with it the threat of moderate to heavy precipitation. In some cases, the precipitation may evaporate before reaching the ground, a phenomenon known as virga. Weather Topic: What are Contrails? 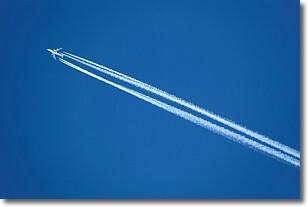 A contrail is an artificial cloud, created by the passing of an aircraft. Contrails form because water vapor in the exhaust of aircraft engines is suspended in the air under certain temperatures and humidity conditions. These contrails are called exhaust contrails. Another type of contrail can form due to a temporary reduction in air pressure moving over the plane's surface, causing condensation. These are called aerodynamic contrails. When you can see your breath on a cold day, it is also because of condensation. The reason contrails last longer than the condensation from your breath is because the water in contrails freezes into ice particles.